"There are four rules you must follow to get good pictures of the Northern Lights," says Markku, his face lit red by the glow of the dashboard. "One: wear warm clothes. Two: know your camera. Three: no light pollution. Four: carry some good luck with you." We're hurtling along dirt roads near the tiny village of Nellim (population 170), where Markku runs the Wilderness Lodge, specialising in Northern Lights 'hunting' trips. I've followed his first three rules to the letter. I'm wrapped up in a down jacket, woolly hat pulled tight over my head. I've learned how to set up my ageing SLR properly for night time shooting, courtesy of a crash course from Markku himself. And the only light for miles is coming from the dash. Unfortunately, I seem to have left my good luck somewhere south of the Arctic Circle. It's night three of my four-night trip to Nellim and the closest I've got to seeing aurora borealis are Markku's own professional shots, taken in and around the village and across nearby Lake Inari. His pictures are spectacular and have helped turn my hope of seeing this natural phenomenon into utter desperation. "You need a lot of patience when it comes to seeing the Northern Lights, especially on cloudy days," says Markku, as we pull up and walk down a jetty over the pancake-flat lake. At first the dark is unrelenting, an inky blackness against which I can't make out my own hand. Slowly though, my eyes begin to adjust. There's a faint green glow on the horizon, I'm certain of it. Markku nods. We wait. And wait. And wait. After about an hour, my fingertips frozen and poised over my camera shutter, we decide to call it a night. "September is when you usually get crazy Northern Lights," he says with a tinge of disappointment as we get back to the lodge. "But you have to be positive." I fall asleep dreaming of a sky streaked with swirling solar storms. Despite coming up short in the aurora stakes, Nellim remains a place of otherworldly beauty. While most visitors head here in the colder months to ride on husky sleds over frozen lakes in temperatures that drop below -30ºC, autumn is a spectacular time to visit. The golden leaves of silver birches and the orange carpet of mosses and lichens on the forest floor certainly lend this corner of northern Finland an autumnal beauty that only New England and northern Japan can match. Throw in huge views across the vast expanse of Lake Inari and the fact that the nearest city, Ivalo, has a population of just 4,000 and you're looking at the perfect place for a post-summer escape. In fact, seeing the aurora almost feels like a bonus when the landscape is this good and the rest of the world feels as distant as the solar storms that cause the Northern Lights to flare up in these high reaches of the Arctic. The next morning, my Northern Lights disappointment fading, I head out to explore with Lammu, one of Wilderness Lodge's in-house guides. It's still grey and a fine mist has turned to drizzle as we drive north, away from Nellim and towards the Russian border, just nine kilometres away. Lammu drives slowly over dirt roads, pulling up occasionally to see if he can spot reindeer in the thick pines. No luck. Instead, we stop on the roadside, and hike deep into the woods. "This was gold mining country," says Lammu, "There was so much you could pick up nuggets of it in the Ivalo river." It happened during the 1870s, he says, when Finland was still part of the Russian Empire. Today there are no prospectors here seeking their fortune and the only treasure Nellim and the surrounding area deals in is the Northern Lights. Still, as we emerge into a clearing onto the banks of the river, it's easy to imagine life here in the 19th century. A riverside channel used to sift the dirt of the riverbed for gold has been restored and a shelter has been built with a fire pit to try and recreate the gold rush vibe. It's all pleasingly rustic. Lammu and I drop our bags and I wander up the river while he cuts firewood. I practice my newfound photography skills on the burnished landscape. The results might not be as spectacular as Markku's aurora shots, but pride swells as I look at my camera and realise that I've managed to capture something of the autumnal landscape. Joe Minihane travelled with The Aurora Zone (01670 785 012; theaurorazone.com) on the four-night Nellim Autumn Lights Over Lake Inari trip with departures in September 2017 and prices from £1,325pp. Alternatively, travel in October 2017 on the four-night Muotka Autumn Auroras trip, priced from £1,265pp. Both itineraries include flights, transfers, four nights’ full-board accommodation, guided activities, Aurora alert service and cold weather clothing. 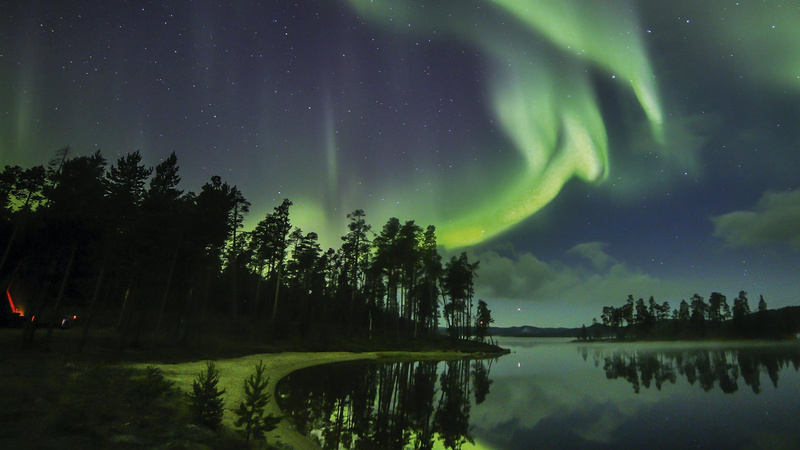 A night in an Aurora Kota can be added from £134 pp. We head back to the car, my feet bouncing over deep moss, the tang of autumn rot and the sweet smell of pines sticking in my nose. A few minutes into the journey, Lammu slams on the brakes, winds down the windows and hushes me to silence. "Over there," he says, pointing past my face. I only catch a glimpse of its bright flank at first, but then it emerges: a huge white reindeer, its antlers resplendent. He strolls on nonchalantly before trotting out in front of us. Behind him follows a harem of hinds and then another enormous male, his breath visible, his huffing audible. I pull out my camera to reel off some shots but only get their backsides as they run off at speed. That night, once again, the Northern Lights fail to make an appearance. Markku takes me to his favourite lakeside spot and we cook reindeer sausages over an open fire, chasing them down with local vodka. He laments our failure, apologising for the cloudy weather which has blighted my trip, but my disappointment has faded. Nellim might be known for putting on a stunning aurora show, but when it comes to autumn landscapes, spectacular wildlife and frontier history, it's no slouch either.